Today was Day #6 of Chocolate, Date and/or Fig Theme Week -- and, more important, it was Halloween, an important "date" to celebrate -- eating chocolate. And what better way to celebrate than an Organic, Dark Chocolate Skull from Mama Ganache (San Luis Obispo, CA) that called to mind Halloween as well as the Day of the Dead (El Dia de Los Muertos). 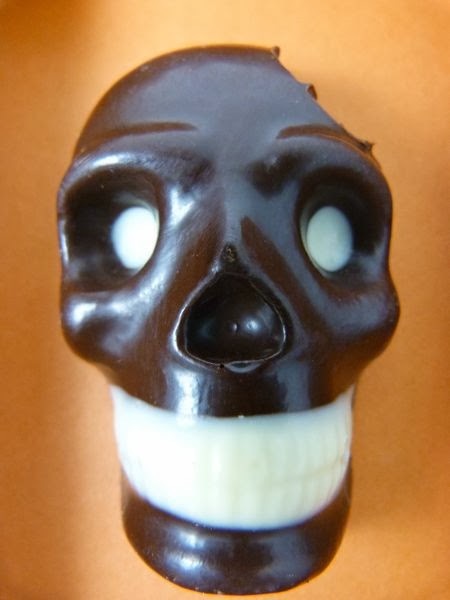 Made from rich, slightly earthy tasting, organic 70% dark chocolate, this skull was decorated with white chocolate eyes, and very straight, white chocolate teeth. Halloween was also a good day for making spooky faces with bits of dried fruit and nuts. Pin these facial features on pumpkins, if you dare. Dates made great eyeballs, or little, fat "fingers." 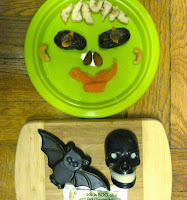 I enjoyed the date eyeballs today, with dried papaya and chocolate chips (for pupils). Piped cream cheese can also be used for the whites of the "eyes." Nothing fancy, just fun.